Learn the Warning Signs of Dysfunctional Relationships. Dysfunctional relationships are actually more common than good relationships. The reason behind this is that it usually takes several tries to find your perfect compatible partner. It's not good to quickly get very emotionally involved with another without really getting to know them. A strong incompatibility between partners may often cause a dysfunction. 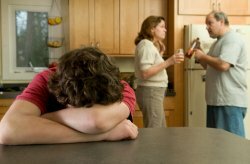 It also often happens that if a child was raised in a dysfunctional family, he/she will subconsciously tend to recreate such a relationship in adult life. The signs of dysfunction are emotional turmoil and lack of satisfaction for one or both partners. There are many different types of relationships that are dysfunctional. Another example is when one partner contributes much more to the relationship (money, work, etc.) than the other partner. This creates an unequal relationship, which is unfair to one or both partners. An inferiority or superiority complex of one of the partners is also a problem because there will also be no equality in such a relationship, making it dysfunctional. Never make a person feel little or acting as though you're better than they are. Another example is feeling trapped, and not being able to get out from a relationship for whatever reason. If there is pressure or fear in a relationship, it's also a very disturbing sign. Constant frustration and unhappiness are other bad signs. What are most people looking for in a relationship? It's happiness. If you are constantly frustrated and unhappy in your relationship, it means that something is going very wrong. There are many other types of dysfunctions in relationships, including: insecurity, jealousy, fear, non-involvement and manipulation. No matter what exactly is causing the dysfunction, it's very important not to ignore it as it's strongly detrimental to the life of one or both partners.